Hello, all you lovely kids out there, we hope that you're having a fantastic time in January. Those of you who need a little inspiration on the same, do make sure to read the previous article on ways to enjoy the month of January. Well, today, we have something special for you. Yes, we do have something. Now tell us what is something significant coming up in the next few days? No, Valentine Day's is not on our mind, umm… we’re not talking about the Women’s Day too; it’s very far away! So, what do we intend to discuss? Well, today we’re going to speak about a global icon who has been an inspiration to millions, a role model and by far, one of the best speakers in the American History! Yes, you are right, he is Martin Luther King Jr. He is the one man who changed the way America seems, forever; he made such extraordinary reforms that laid foundations to make the great country America, we all know today! Martin Luther was born in a family of Baptists and clergymen and was raised in a comfortable environment. Of course, he was nowhere very wealthy, but he did so many marvelous things that resonate the fact that money cannot buy everything, or better still, you do not require money to bring about a lasting change. We need to know and understand that great leaders do not live only in the house of the wealthy, but they also breed in the homes of the modest and also the lesser fortunate sections. Martin was influenced by Jesus Christ at an early age, and he decided to adopt Christ’s teachings as a way of life. Martin firmly believed in Jesus Christ’s idea of ‘loving your neighbor as yourself.’ He was born in an age where African Americans were in an indigent condition. Those times reverberated the atrocities and sufferings Black Americans faced due to being ‘colored.’ Racial abuse was the social order of the day. Undoubtedly, it takes an immense amount of perseverance to lead out a war against injustice especially if you’re the weak class, but Martin Luther did that triumphing over all the negatives that surrounded him. He was sent to prison several times, was beaten up, threatened to death and was treated downright inhumanly, but he never lost hope and went on battling because he knew that he was right! But his greatness doesn’t end just there. He detested (time to get your dictionaries out, sweets) violence and injustice, and so gave up violent means to achieve justice. To bring out references from history, Martin Luther’s Civil Rights revolution happened just a little after the Second World War’s massacre. And needless to say, World War-II did see a lot of mass destruction. King having had vowed never to take up brutal or cruel ways to accomplish his noble goals. Therefore, he went on Civil Rights movements using non-violence and civil disobedience acts based on core Christian beliefs. And rightfully, he did succeed! He succeeded in freeing a nation where misfortunate classes of the society were handcuffed with the humiliating practice of slavery. He managed to teach a nation the values of nonviolence, including unconditional love, tolerance, forgiveness and reconciliation, something that are so desperately-needed to unify the country of America. Little friends, Martin Luther King, was only in his 30s when he led revolutions and battled against all odds to become an international force to reckon. The worldwide leader is said to derive the teachings of non-violence and peace by the great Indian freedom fighter and Father of Indian Nation, Mahatma Gandhi (Did anyone of you watch the movie Gandhi? Yes, exactly, it’s his story). Mahatma Gandhi was a man of simple principles and morals and that enlightened King (as Martin Luther King is fondly addressed) and he sincerely embraced those virtues. In the year 1951, he was awarded the Nobel Prize for his outstanding work that changed the face of an entire country. In fact, he was essentially lauded for his non-violent means to turn his far-fetched dreams into a reality. 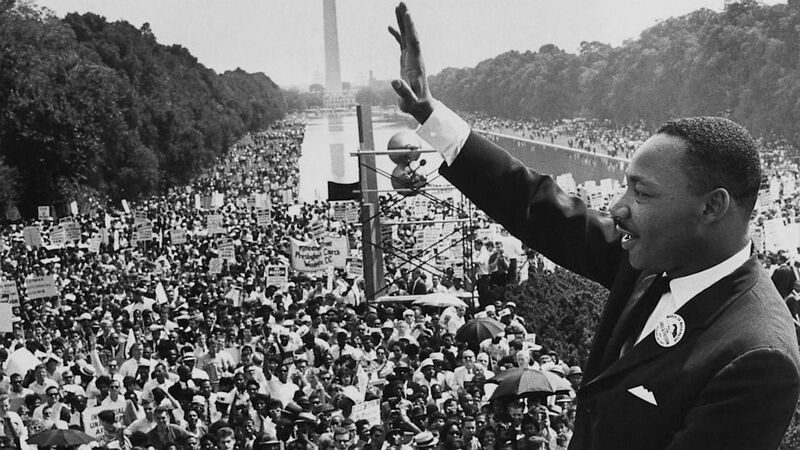 His speech, ‘I saw a Dream’ is one of the most iconic speeches ever in the modern history of man. Now, let’s come to discussing a day that celebrates the greatness of this thorough extraordinaire! This day is significant because it commemorates the splendid contribution of the greatest champions of justice, peace and reconciliation. We call it the Martin Luther King’s Day; it is used as a special way to honor the birth anniversary of this exemplary frontrunner. The Martin Luther King’s Day is not just for the African Americans, but it is for People, the people who constitute you, me and everyone around us; it’s a day to celebrate humaneness; it is a day to celebrate equality and insuppressible love for your people, and humanity, in general. King was born in America, but each year, nearly 100 different countries celebrate this international hero’s birthday with great pomp and show. These things only give ample support to the fact that Martin Luther King was a man of impeccable character, possessing an intrepid sense of attitude. There is so much to learn from King that it might take over a lifetime to even come close to half of his immaculate personal attributes. But yes, we can try, we can always try and become the best versions of ourselves. Martin’s incredibly eventful life reiterates that we do not need to be born in an over-the-top rich family or be blessed with flawless beauty. But what we need is a character and inner strength. Many people on this planet fail to accomplish their goals because they lack perseverance and will power. They may hold great ideas of change and prosperity, but they remain unsuccessful because they fear to raise their voice against the evil and most importantly, they fear to dream saying that dreams don’t come true. In Martin Luther King’s excellent speech on Human Equality and his wish to see America as colorblind to people’s complexion resonates how simple means in life can achieve extraordinary things! We urge all of you to stand and take an initiative to be part of the change and yes, be aware of the fact that Change starts with YOU! Thus, dream, think, stand up, run, work hard and no one, yes, practically no one, could ever possibly stop you from reaching the presumed unobtainable! God has blessed each one of us with an indefinite amount of talent and strength. If there’s any right time to achieve your ambitions, then it’s now, it’s here. Just go out folks, you’re about to unleash the astonishing power in you! On this very special day, we at Best Brains, go all out to educate people about the iron-will of a mere man, who set out to change the history of a country and make it one of the biggest democracies across the entire globe! We’d render a couple of lines to this very noble soul and say: In your selfless services we lay our salutations, no one can ever possibly defy that you will always be one of the best sources of inspiration and human expressions!